Most people who have worked with cats have seen cats with runny, pusy eyes and noses, sneezing and sometimes being quite unwell. This is ‘cat flu’ (picture 1). 80% of cases are caused by either Feline Calicivirus (FCV) or Feline Herpesvirus (FHV) or both together. Cats with poor immune function will be more seriously affected and possibly die, e.g. cats with FIV or FeLV, elderly or malnourished cats, or kittens with low natural immunity against the viruses. 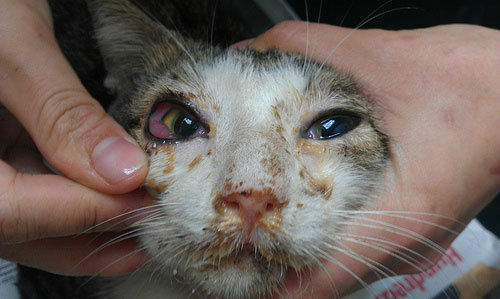 Both FCV and FHV are passed on from infected cats in their saliva, snot and sneezes. FCV can survive in a dry environment for a month so cats can pick it up from the environment. Both viruses cause the typical ‘cat flu’ signs of upper respiratory tract infection and fever, occasionally leading to pneumonia. 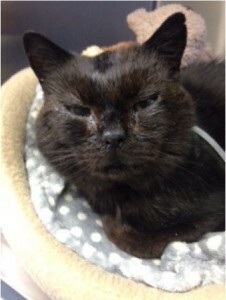 FHV can cause corneal ulcers, and can result in chronic rhinitis (those cats that just keep on sneezing). Eye infections in young kittens can cause particular damage ranging from a fairly minor, cosmetic problem to completely obscuring the eye. FCV often causes ulcerations in the mouth (picture 2). It can also cause ‘limping syndrome’, and chronic gingivostomatitis. Generally, symptoms usually resolve spontaneously within 1-2 weeks, but cats can still shed virus for about 1 month. After this, some cats will fully clear the viruses, others will remain persistently infected, sometimes with no symptoms but still shedding the viruses. They can also suffer relapsing symptoms. Secondary infections with various bacteria and other organisms can complicate the picture. Antibiotics – against secondary infections; given as injections, tablets +/- eye treatments. Anti-herpesvirus medications for severe or refractory cases (eg non-healing eye ulcers) – oral tablets (famcyclovir) and various eye treatments. Pain killers (anti-inflammatories) only if the patient is well-hydrated. Mucolytics (drugs to loosen up mucus). Nursing care for those that can be handled; this includes providing a warm, quiet, stress-free environment; cleaning eye and nose discharges; steam vapour to help unblock their noses (do NOT use Olbas Oil or Menthol); and encouragement to eat and drink – using warm, strong-smelling foods, and possibly hand-feeding or syringing food and water. Vaccinating cats certainly helps. The ‘flu’ vaccines are a combination of FHV and FCV. Vaccination is not 100% effective, particularly FCV vaccines. (Please see website for further information in extended article). 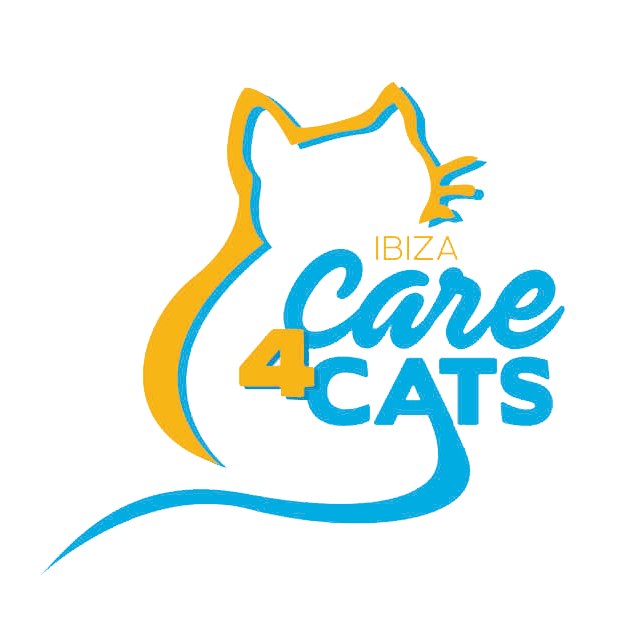 Isolation of affected cats within a household or shelter from non-affected cats, can help prevent transmission. Cleaning with products that will kill FCV is important as it lasts 30 days in a dry environment, and is not killed by all disinfectants. Suitable cleaning solutions are sodium hypochlorite (5% bleach, diluted to a 1 in 32 dilution – rinse off thoroughly after use! ), potassium peroxymonosulphate (eg Virkon S), chlorine dioxide, or other specific anti-virus disinfectants. Sneeze barriers – solid glass or plastic – are better than metal cages at a shelter or cattery. NEUTERING free-roaming cats helps prevent the spread of all transmissible diseases, as they are less inclined to wander and are generally healthier cats. Feeders looking after colonies of cats can help too, by regularly washing food and water bowls, and providing nutritious food. Chronic gingivistomatitis – inflammation of the gums and soft tissues of the mouth persisting for more than a few days.